The Willow Lyocell Siberian Down Blanket has been discontinued. The Willow luxury down blanket is elegant and refined in its look yet functional and perfect for cool summer nights. 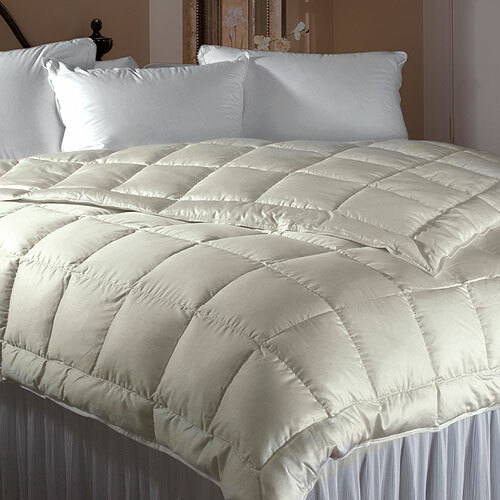 Filled with the highest quality, hand gathered, large cluster Siberian white goose down and covered in luxurious, pearl colored 100% Tencel® lyocell; woven in Austria. The lofty and lightweight 800+ fill power Siberian goose down is hypoallergenic, having gone through a stringent cleaning process that removes dust and dirt to bring you the finest and cleanest down possible. The eco-friendly Tencel® lyocell tick covering is down-proof as well as lightweight, breathable and cool to the touch, offering the luster and luxurious drape of silk. Finished with an 8-inch quilted box construction and double stitched edge piping. Made and filled in Hungary. Professionally clean. Lifetime Warranty on craftsmanship. During the summer time, I often sleep underneath a Willow Quilted Down Blanket and enjoy the lightness that it affords. At some point during the Winter, I turn to a heavier weight comforter of some kind, but most of the year this light down filled blanket allows me to sleep comfortably without over heating. The workmanship details on this down blanket is excellent and the quality of the down is top notch. It is not our lowest priced blanket, which is my only grumble, but setting aside that one caveat, this is a beautifully made product and if you are looking for a lightweight but quality down blanket, you cannot go wrong with this one. It is a 5 star winner. Warranty: lifetime warranty against manufacturer's defect. Please Note: This is a custom order and not returnable unless covered under warranty. Availability: these blankets are custom made per order and will ship out within 3 business days.